Rings based program, developed in collaboration with Fitness Revolucionario, experts in the design of full body training. 10 weeks of periodic and progressive training, based on blocks of training. You will develop strength and musculature, and improve your overall physical condition. We start with the basic principles of ring training and progress to more advanced techniques. +100 exercises. Basic, intermediate, and advanced exercises, adapted to the level of each user. Including upper and lower body sessions, for a balanced and athletic body. Complete. Works the whole body on all planes of movement. Starting with warm-up and ending with mobility. Global. Developing all of the physical capacities, from strength and muscular resistance, to improving stability and coordination. Adaptable. The majority of the exercises can be adapted to any level, beginner to advanced. Progressive. It starts with the basics and adds a bit of difficulty each week. Periodic. Built into blocks of training to optimize performance and recuperation. Versatile and portable. 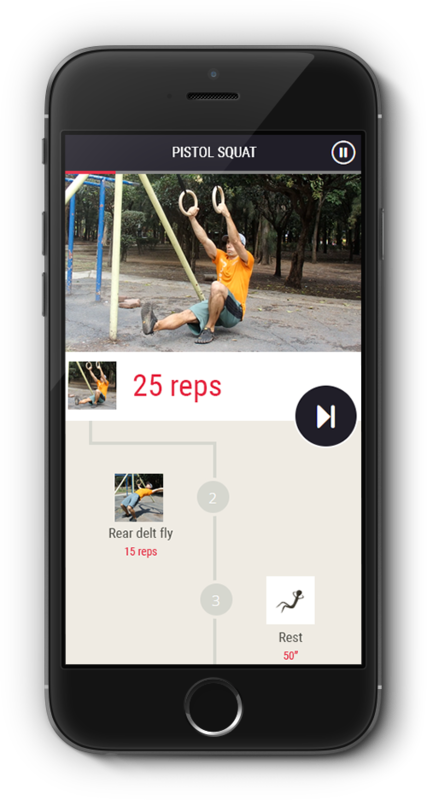 They allow you to perform a multitude of movements and also simulate suspension training. They weigh little and you can take them anywhere.